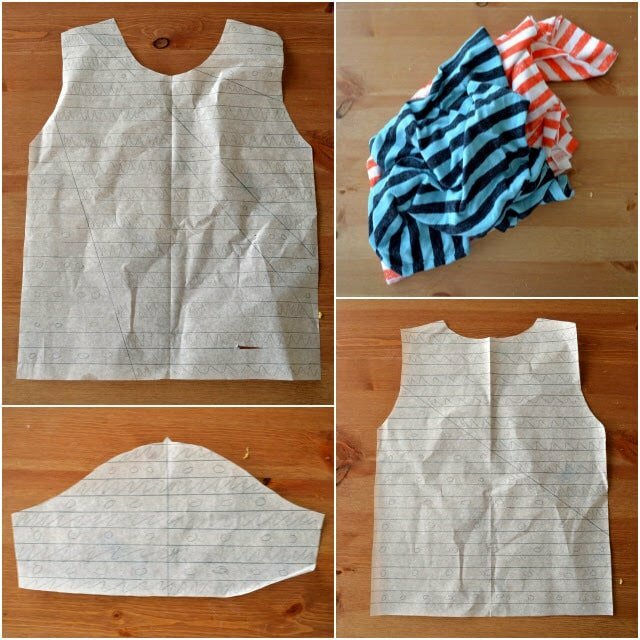 I hold onto fabric scraps, but when they’re printed or striped it’s almost impossible for me to throw away. I just love prints and stripes! Well after looking through some of my striped scraps, I realized I had some that were the same height. I wanted to piece them together for a cool striped “striped” look! And this will look good with any striped fabric, not just knit. I did use knit for my example, but it would look great on a woven skirt or dress or pants! 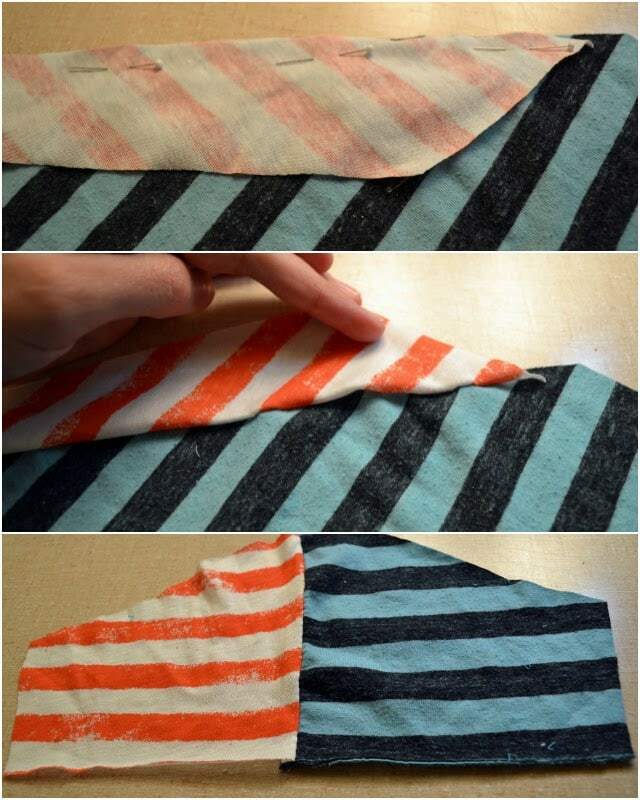 If you are sewing stripes this is how to match stripes. 1. 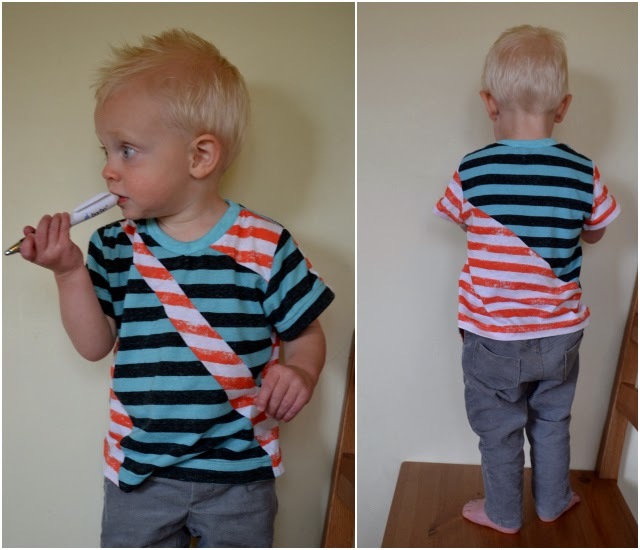 I traced a pattern and then drew the stripes right onto the pattern. Then I was able to draw the piecing I wanted to do. I also colored in the black stripes and drew o‘s for orange. 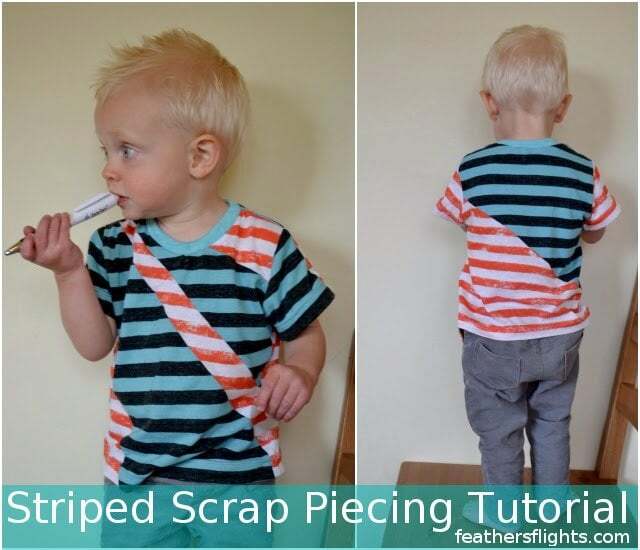 You would design your stripes and pieces based on the scraps you have. 2. 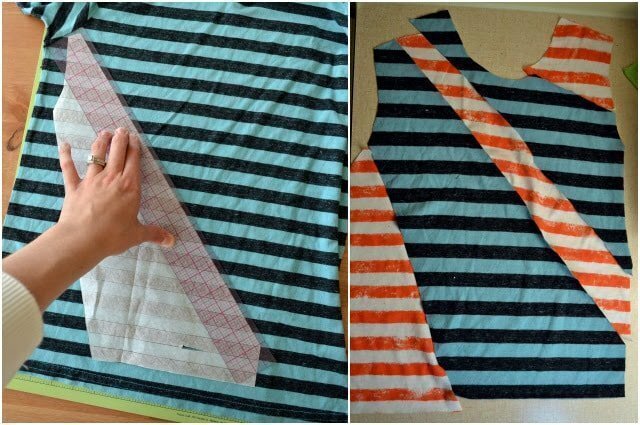 I cut up my pattern pieces and separated them into the orange stripes and turquoise stripes. I cut them out but added seam allowance to the piece edges. 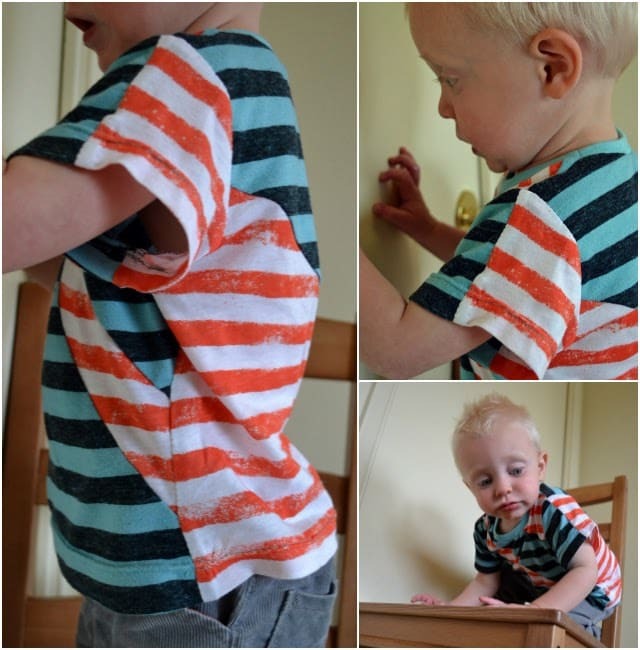 You could also tape seam allowance onto the pattern. 3. I laid out my pieces so I knew which order they needed to be in. 4. Because all my piecing were diagonal to the stripes, matching the stripes were a little difficult. I found the easiest way was to pin the seam allowance and then look at the front to see if the stripes matched. I would adjust until the stripes matched. Then I sewed the pieces together. It was a lot of matching, but I love the skater-ish look it created! I didn’t match the front pieces very well, but from far away it looks okay. The back and sides look great though! And there are so many things you could do with the piecing! 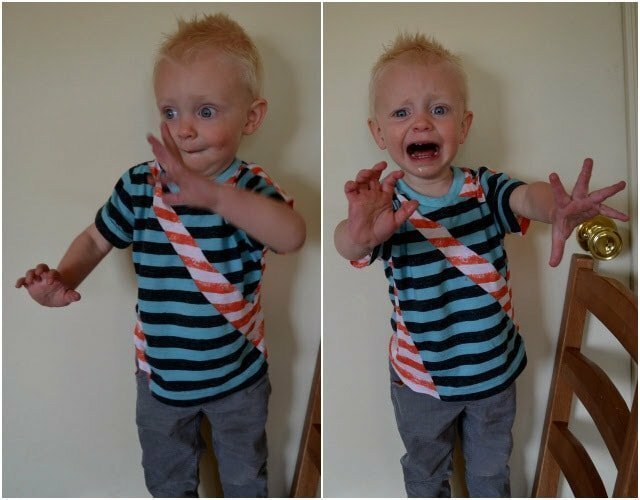 I asked Henry to do some dances moves which he did until he got mad. I love that dancing picture! Sweet dance moves. I think this would of worked with different sized strips as well. Looks great. Love how the shirt turned out! Super cute! Cute! This shirt turned out really fun. He is getting so big! Love the trendy shirt. Looks great! Cool shirt! I like how you used two different colored sets of stripes! Awesome! 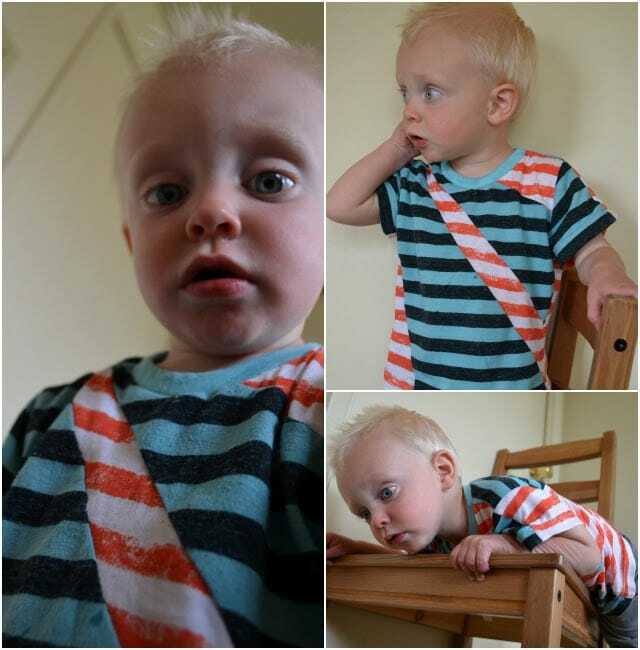 Those last two pictures, he looks just like Calvin.